Captain Maxx is the original creation of Mark Nagata, founder of Max Toy Co, as a combination of his love of Ultraman and his son Max. Since his initial release a few years ago, Captain Maxx has developed a small menagerie of fantastically original enemy Kaiju. An unpainted flesh Captain Maxx was released in a Battle Pack with an unpainted Gumos insect kaiju, and the set was one of my first major vinyl purchases. I couldn’t decide which of the available Captain Maxx figures I liked best, so I decided to get the unpainted figure and make my own! 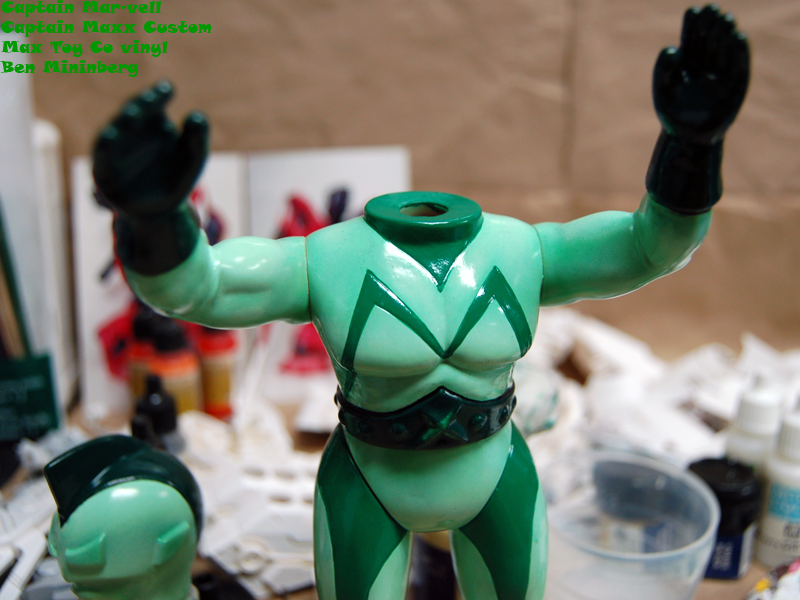 When I saw the Captain Maxx design, the Ultraman influence was apparent, but my first thought was ‘Captain Mar-vell’. The figure reminds me of Captain Mar-vell (from Marvel Comics, not DC’s Shazam!) original Kree battle suit, which he wore in his early comic career. Mar-vell Maxx here is also the first figure I have used my new airbrush on… I did the initial base coat with the brush, and then the highlighting of the base suit color (I went for a mintier base color than the pale in the comics). 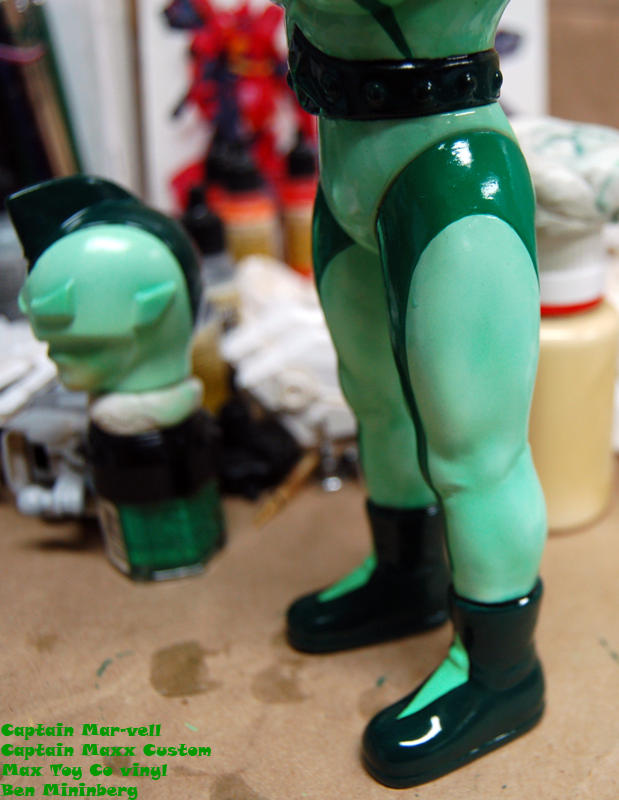 I had a good time doing the fine highlighting on the light color, but could not replicate the results on the darker green yet… I am using Cel-Vinyl paint from the company Cartoon Color, and it sprays well, but works best at low pressure for the fine point way I use the airbrush. Right now all I have is canned air, which has poor pressure regulation… the only reason I was able to get the results I got the first time was because the can was freezing over and running out of air, so I am working on picking out a compressor so I can start using the airbrush more. 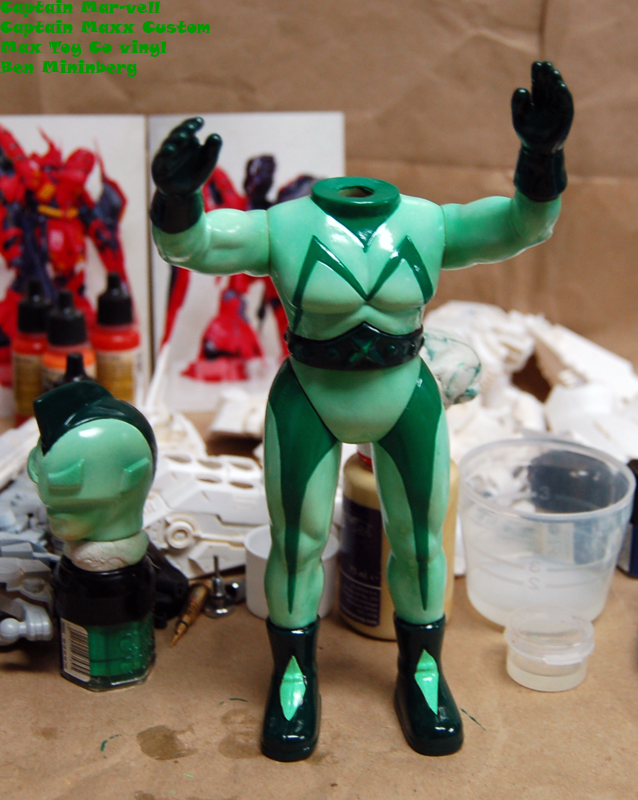 The figure is shiny right now because it has multiple coats of Future on it as I finish sections, so that I can do any hand painting work without risking messing up anything airbrushed. I’m going to add highlighting to the dark green sections, as well as some other details and hand paint the Kree planet logo on his chest in another green so it stands out. I love it !!! My fav Captain Marvel was the 60’s Marvel one to boot !! Show me the final version !! !